The Duffy 42 by Campbell’s is a 42 ft. sedan or flybridge cruiser that has two staterooms and one head with separate shower stall. Galley up with dinette-settee that will seat four comfortably. All bulkheads are constructed of balsa core panels with laminate veneer. Trims and doors are cherry (or wood of choice) with satin finish. All exterior finish is Awlgrip. 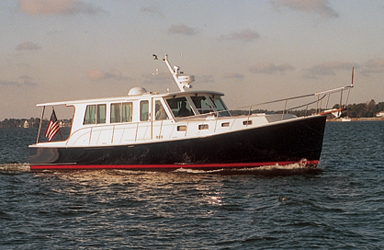 The Duffy 42 hull was designed by Spencer Lincoln with a designed displacement of 24,000 lbs. Many of these hulls have been put in service commercially and recreationally in the past 15 years. Her plumb stern and lively sheer give this boat true character. The full keel, round chine and sharp entry forward make her perform well in all conditions.